what’s that equation in daniel’s notebook? Last Tuesday night Daniel Faraday Widmore busted out his leather notebook and revealed to the Des of the Widmore-employed, smooth hair variety that he happened to doodle some complex math equations in his notebook. The trick was that Danny F was a musician, not an advanced physicist. While many have hypothesized that it woud have made much more sense for “If anything goes wrong, Desmond is my constant” to be written in the notebook, maybe that will be revealed in time… OR maybe Desmond was never really Faraday’s constant, but Charlotte was. It seems one has to have a strong bond with one’s constant and the visions that Dan, Des and Charlie saw seem to point to strong connections of love between two people… two CONSTANTS. In fact, maybe the key to uniting the two realities — or at least connecting them — is through one’s constant. The relationships on the show are constantly (ha. ha.) emphasized, so perhaps a strong bond can unite two disparate time periods? “Not really. A closed timelike curve is a real thing, but this is not a diagram of one. It’s essentially your standard lightcone for ordinary causality with a few extra doodles and generally gibberish labeling. It seems like someone grabbed a standard diagram from somewhere and then added some stuff to make it special. So… it took a few times reading it over (guess what? I studied English! ), but I seem to be getting what Doug’s after. 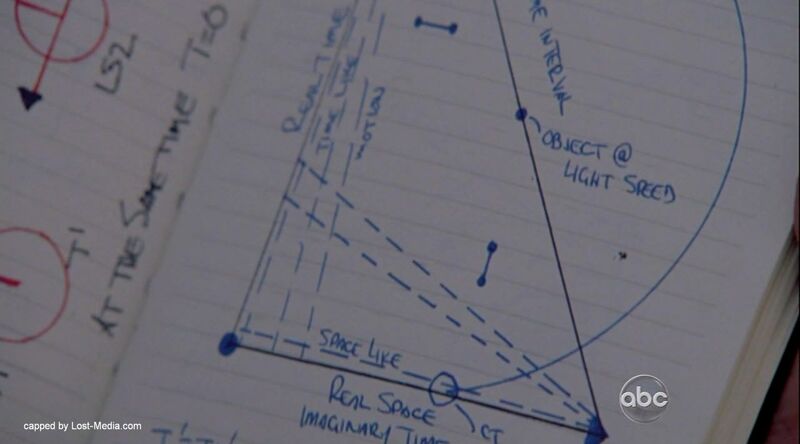 In the context of science, Dan’s drawing doesn’t really fly. But if we’re thinking storywise (and note that Doug is not himself a fan of LOST, though D&D is another story), it appears as if one central event may be passed through again. Now, I immediately think to the plane crash, where Desmond didn’t push the button in time and caused 815 to go down. What if Desmond had the opportunity to do that moment over again? The plane wouldn’t crash and the 815ers would go on with their lives. If the 815ers never came, perhaps Des and Penny would never be reunited — after all, there would be no Locke to insist on letting the counter go down and without that Des would not need to turn the failsafe. Then his sacrifice would be giving up his life with Penny and Baby Charlie Hume and he would live out the rest of his days on the island. Or maybe there is another central event, maybe one we’re not even aware of yet. But Doug says that everything would be the same. Is Dan’s work trying to thwart that sameness, trying to slightly alter the time you’ve come back to? In any case, I’m really liking the implications of this theory. I think the idea behind it — that you come back to the same exact point in spacetime, a defining moment. There have been several incidents on LOST where characters attempt to change their destinies, to alter their predetermined futures (or, in the case of Jack in “The Incident”, their pasts) but the island always comes back to haunt them — whatever happened, happened. There’s bound to be some kind of course correction. But the question we have to ask ourselves, with only five episodes to go before the finale, is: which course is correct? And how will we reunite not only these two parallel timelines (whose significance were represented in Eloise’s star brooch), but also the machinations of Hawking/Hume/Widmore with Jacob/MiB? My current endgame theory is that the tension between all opposing forces will come to a head, leading toward a collision that may ultimately lead to neutralization. Both Jacob and MiB are dangerous, manipulative forces whose meddling has caused much strife. Perhaps they will have to take each other out in order to free the castaways and, by extension, the world from their power games. With all their powers combined they are — CAPTAIN (SAVE THE) PLANET! And maybe, ultimately, we’ll be left with an amalgam of two worlds and the island will become a resort or something ridiculous. One more quick thought re: Widmore and Hawking. It was brought up on The Fuselage that although we don’t know either of their motivations quite clearly as of yet, that perhaps their aims here are opposing. Maybe the reality they’re fighting for is the one allows “their” child to live. Eloise wants her beloved Daniel; Charles wants his beloved Penny. But ultimately, one may be sacrificed for the other? Charles will accept the Crash Reality because it allows Penny to live, even if they are estranged. Perhaps she is doomed in Sideways World. In Sideways World, Dan is free (as of right now) of his physic-al burdens and is happy as a musician. There are many holes in this theory, of course, but I’m thinking parental love may come into play for these two former/current lovers. In any case, I am v. excited about where this is going and can’t wait to see how Hurley’s story will play into it all next week.